Hello, lovely people. Hope you’re doing marvelously well. So here, we’re back again with Little Empire’s song, Stay New. Now, what I’m going to do in this lesson is just talk about the guitars, and this one is a very simple one. I barely did anything to the guitars. Why is that? Because I recorded them the way that I wanted to hear them. Now, I did these with an Egnator amp. Yes, you heard me right, an Egnator amp. It’s one of the first ones they made, and it’s a really, really good sounding amp, to be honest. I really liked it. It was perfect for this. We did like, a slightly distorted tone. Now, what I want to talk about here is the ability of getting width, and what the guitar parts did for production, but firstly, as ever, subscribe, go to Produce Like a Pro, sign up for the email list, try a fourteen day free trial of The Academy. All kinds of fun stuff, but download the files if you haven’t already, because we’ve done the drums so far, we’ve done the bass, and now we’re doing guitars, so go and download the files, and you may have already mixed the song, and you just want to see what else I did on it. Totally fine. The great thing about this song is there’s lots of room to do whatever you want. You can mix this, remix it, whatever you’d like to do, and of course, please post your mix on Facebook on the Produce Like a Pro Facebook page, and tag Little Empire. There will be a link here telling you where Little Empire’s Facebook page is. Tag them, and I’m going to make them comment on it and listen to all of the mixes as well. So for further ado, let’s get on with this. Okay, so what do we have going on with these guitars? Well, the two — it’s not me doubling my part, as I normally would. These are two very, very distinct guitar parts. So a couple of things. I’ve printed a DI, which is the track number 14 here, and track number 16, so you can do whatever you like. You could take that and reamp it, you name it. But here is guitar number one. Now, a couple of things. It’s the Egnator. It’s set to like, you know, a distortion. Not like full blown metal, but like, nice and chunky kind of distortion, but on single note. So I’m just playing, [mimics guitar]. You know, I’m playing it just tight and down strokes. The only EQ is this. I’ve got some low mid boost here at 250. I’m rolling off gently at 127. So I’m high passing gently there, but it still sounds pretty fat. And I’m boosting 7kHz, but with a gentle slope. So it’s like 7kHz, but then it’s also kind of coming down to like, 3 to 5. So it’s catching maybe 4, 5, and above. It’s a typical thing I do, and it just gives me a nice high boost and some low mids. What else am I doing? Well, the trick that I always do. So, what we’re going to do here is we’re going to flip them like such. So now I have this guitar. Panned to the right, and its reverb going to the left. It just gives us additional width. Okay. Now, let’s go to our other guitar, and you’ll actually notice this is a different part. So I’m just, [mimic guitar two]. Together. And again, reverb, EQ wise, the same EQ. Even though I’m playing in a different position on the neck, a little lower, and I have not done full blown — I have not done full blown left and right of the same part. They’re different parts. Here’s the bass with it. So you can tell — you know, the nice thing about high passing at 127 and gently like this is it lets the bass, the low end of the bass living in here. It’s not an aggressive high pass, but what it’s doing is it’s allowing those two instruments to just glue together enough so that there is some crossover in the low end, but they’re not completely separated, so it sounds — you know, over the top, but using high pass is your friend when you use it constructively. Cool. So you can see there, the bass is sitting away from it, away from the guitars, the guitars — they’re not in the way of the snare, just that little tiny scoop. Again, you know, I was talking about in the drums, it’s not about necessarily being so surgical in this situation that I have to remove all of the mid-range from this to allow, you know, the snare drum to hit, or anything like that. The reality is, it’s there already. I’ve got — I’ve boosted some low mids, and I’ve boosted some top, so I’ve left a lot of room in the middle here for the snare to just sit above it. You hear that snare fine. It still sounds natural. The fun thing about this song is you can throw in the vocal, and you’ve got a pure, just kind of indie pop song. Yeah, I could do all kinds of stuff with that. We could do just a pop kind of indie guitar, you know, guitar, bass, and drums version there. So that’s essentially all that I do. Now, with the reverb, I’ve got 500 milliseconds decay, so it’s not huge, it’s just there, just to give it some space. So guitar is panned one side, another guitar is panned the other side, and there’s opposite reverbs to create width. So that means one guitar over here with its reverb on the other side, this guitar over here with its reverb on that side. Now, you could go crazy on it. It might be kind of fun to take the DI and distort it and try other things. You could also take — you could also take itself and double it against itself if you want to make it bigger on the guitars, but I think it pretty much works like this, but don’t be afraid to try different things. The other thing about doing a simple kind of arrangement with just the guitar and the bass and the drums like this, you could put a phaser on it, you could try all kinds of weird kind of effects to try to get a different feel together, but on the whole, the basis of the song was these elements. And we’re also going to add the keys into this video. The reason why is for very similar reasons why the guitar one is so short. I didn’t do a great deal to this. What we did is we grouped them all together, they’re all Logic sounds, so they’re sounds that were printed in Logic using pretty standard Logic sounds that you can get. There’s some synths in there, there’s some staccato strings, legato strings, the thing about them that you will enjoy is they’re already EQ’d and compressed inside of Logic the way that we wanted to hear them. So it was more of a level balancing thing. There’s some fun stuff in here, which you can steal for other projects, such as reverse cymbals, here’s one here going into the second chorus. You probably have some reverse cymbals, but they’re fun. There’s a riser, which is really, really cool here. Again, all of the delays were printed on it. There’s a fun staccato string part here. With the reverb printed on it. Now, this is the kind of stuff that you’re going to get. Sometimes, you’re going to get MIDI files, however, it’s really, really nice when the producer sends you these files. When the producer sends you it the way that they hear it. Quite often these days, you’ll get the session ready to mix with all of the plugins already on it. That can be good and that can be bad. What can be bad about it is you might not have all of the same plugins, but what we’ve done here is we’ve given it the way — yeah, with the plugins on it, but printed. Quite an 80’s synth going on over the legato. Cool. 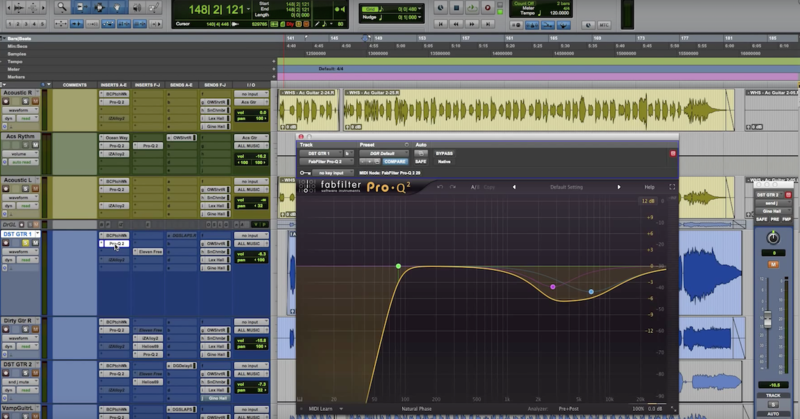 So there’s a couple of cool things that we did inside of Pro Tools that are worth noting. Up above here, you’ll see the Vacuum. Now, I’m going to leave the MIDI with you, so if you — when you open up the session, you’ll see this MIDI channel here, and it’s got the Vacuum sound on it, which is a — you know, it’s the AIR, Advanced Instrument Research — it’s a really, really cool plugin. A really good virtual synth. There’s an R-EQ here just wiping out the bottom end on that plugin, and it gives us this. It’s just messed up. The other MIDI file I’m going to give you is for the Rhodes, which is just from Velvet here. Really straightforward. And this was Lily’s, the singer’s, scratch keyboard part, and she would play it on her Nord, and then we would take MIDI and do whatever we’d like afterwards. You’ve got that MIDI, you can do all kinds of fun stuff. There’s the pad. So it’s really all about level matching. As you can see, I’ve done a lot of different levels here. You know, that pad’s relatively hot. The Rhodes is up there, and then I’m just bringing things up and down as needed. Here’s a really cool synth going into that first chorus. Ah, play it in a second again. Yeah, I love that. So silly. So basically, they’re all grouped together, and that’s going through a G-Channel. Just some lows. There it is. Kind of dark. So even though in Logic, we EQ’d it the way we wanted it to be, once we put it into the mix, it still sounded a little dark. So instead of, you know, because the sounds were built to work together inside of Logic, once they were blended the way we wanted to hear them, then we’re just doing a group thing. So bypassed, this is the group of all the synths. It’s great. Now what am I doing? I’m doing a 12kHz here. Basically, I’m low passing at 12kHz. I’m high passing at 70Hz. So there’s nothing below 70, so it’s not getting in the way of the kick, it’s not getting in the way of the super lows on the bass. I could probably even come up slightly higher, but it’s about 70. I’m then boosting some high end. I’m boosting at 10kHz. I’m also boosting some mid, mid-range at 1.5kHz, and then I’m cutting that stodgy low mids. So, the stodgy low mids are in the drums this time. You know we were talking about that in the drum video? So I’m cutting them out of — listen. 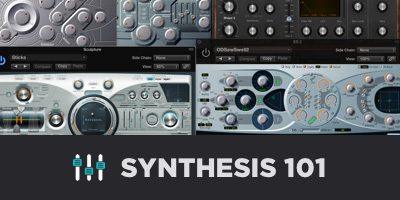 Sidechain synth from the kick. Print it. Cool. So now what you see there, or what you hear there, is like, all done in the production. The sounds are chosen to work with each other, they’re EQ’d to work with each other, and then as a global, all of those are bussed to a stereo fader, and that EQ. There’s no additional compression. It’s all done — printed the way that you wanted it to hear — It’s all printed the way that I wanted to hear it. Now, quite often on classic records, that was the way that people made records. However, you can get in there, and you can carve up, you can distort, you can have a lot of fun, but this is the way obviously that I chose to mix this song, but you can get in there and go absolutely nuts. You could push things. There’s a couple of times I feel like the Rhodes could be a little bit distorted and dirty. It could also have a little bit of slap on it, but then it might want to come down in the chorus and just be featured more in the verse. There’s a lot of really cool production stuff you could get into it. It could be really, really amazing. So have a blast with that. Enjoy it. Please, if you do a mix of the song or when you do a mix of the song, post it on the Produce Like a Pro Facebook page. Tag Little Empire band, and I’ll make sure that they respond and listen. Please, any comments and questions below, would love to hear how the mix is going. If you want to exchange some ideas, let’s have a conversation about it here. This is really, really good for exchanging different stuff. You know, I’m mixing this really simply. I haven’t done as much crazy EQing on the drums as we’ve talked about before, its a lot more low mids, it’s a lot thicker, there’s a lot more girth on this track on certain — than some of the other tracks that I’ve done, but I like what it’s doing here. There’s also a lot of keys about to come up, so we’re going to get into that next time. Have a marvelous time recording and mixing, and I will see you again soon!